What foods and supplements really alleviate arthritis? Eating fish does – but so do other foods and supplements – so read on! There are over 100 types of arthritis and related illnesses – including fibromyalgia and gout, but the most usual are rheumatoid arthritis or osteoarthritis. The common factor is that they are mainly painful diseases of inflammation. This is, of course, an auto-immune disease which affects three times more women than men, generally starting when the sufferer is aged 40 – 50 years. This occurs when the cartilage that lines the joints begins to wear away – meaning that the cartilage lining starts to roughen and become thinner, causing tendons and ligaments to work harder. 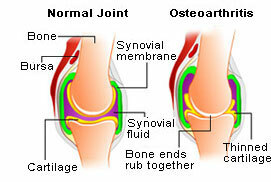 This in turn can cause swelling, inflammation and possibly the formation of bony spurs, called osteophytes. In acute cases, bone rubs on bone when the joints move, which causes inflammation, acute pain, swelling and stiffness – leading to restricted mobility. Osteoarthritis affects 10 million people in the UK – about one person in every 15. And 1 in 8 over the age of 50. Why the correlation? Because chronic internal tissue inflammation is a key driver of almost all so-called ‘age related’ diseases. We say ‘so-called’ because it isn’t ageing as such that causes the diseases – it is the accumulated damage to cells and tissues. And it is inflammation (and excess free radical action) that triggers this tissue damage. To the extent that inflammation is virtually always involved in arthritis – and other illnesses – can diet help? It’s an important question when the side effects of prescription pain relief NSAIDs (non-steroidal anti-inflammatory drugs) – like ibuprofen, naproxen and high-dose aspirin – can include stomach ulcers and possibly even heart attacks. Research shows that people who regularly eat oily fish, which are high in omega-3 fatty acids, are less likely to develop rheumatoid arthritis (RA). And Omega 3 oil helps reduce joint swelling and pain in those who already have the disease. The same research shows that anti-inflammatory effects from omega-3s are helpful not just for relieving arthritis, but also for preventing other diseases linked to inflammation, such as heart disease and stroke. The best sources of omega-3 are fatty fish, such as salmon, tuna, sardines and mackerel. Eating a 125g / 5-ounce serving of oily fish 3 times a week is recommended for lowering inflammation, easing joints and protecting the heart. Unfortunately, many fish that are rich in omega-3s can also be high in mercury. So a valid solution – especially if 3 portions of oily fish a week is an unrealistic target – is to take an Omega 3 fish oil capsule that is from a sustainable and mercury-free source. But oily fish is not the only source of anti-inflammatory food. A 2013 study (on mice) showed that cruciferous (leafy green) vegetables which contain a compound called sulforaphane can help slow cartilage damage in joints due to osteoarthritis. These include broccoli, kale, Brussels sprouts and cabbage. An easy way to top up on these valuable vegetables is through stir-fries, curries and soups. One of the best-researched anti-inflammatory fighters is the spice turmeric, which contains a compound called curcumin. A 2012 review published in the International Journal of Molecular Sciences said that “curcumin could be beneficial in the management of chronic inflammatory-related joint disease”. There are now over 500 studies confirming that curcumin is indeed one of the most powerful anti-inflammatory compounds, which is why curcumin supplements have been shown to help reduce the risk, not just of joint inflammation and pain, but of heart disease, stroke and even Alzheimer’s – as there is an inflammatory element in that disease too. But curcumin does have a disadvantage – it is not normally well absorbed by the body unless it is accompanied by a fat source. So an Omega 3 and curcumin combination is ideal. Another way to make curcumin more bio-available is to consume it in conjunction with black pepper, as a compound in pepper, called piperine, increases its bio-availability. So recently some daily combination health supplements, like NutriShield, have added piperine to their formula. Garlic is a member of the same family that includes onions and leeks. The Rheumatology Center of San Diego confirms that these all contain a plant compound called diallyl disulphide. A 22 year longitudinal study from the University of South Florida has reported that people who took vitamin C supplements were 11 percent less likely to develop knee osteoarthritis than those who didn’t take the supplements. That’s logical as cartilage is made of collagen, and your body requires vitamin C to make this protein. However, once the condition was established, vitamin C appeared to have only a small effect on its progression. A number of people with arthritis report relief from eating tart cherries and drinking tart cherry juice. These cherries (the best-known are probably Morello cherries) contain a polyphenol (a potent plant compound) called anthocyanin that gives the cherries their colour. A 2013 study published in Osteoarthritis and Cartilage found that subjects who drank two 175ml (6-ounce) bottles of tart cherry juice per day for 6 weeks had improvements in the pain and stiffness caused by osteoarthritis. Drinking the juice also lowered a blood marker for inflammation called CRP or C-reactive protein. In an animal trial at Case Western Reserve University, researchers found ‘strong evidence’ that pomegranate extract (rich in anti-oxidants) helped supress inflammation and delay both the onset and reduce the severity of osteoarthritis. A huge new area of study now is the microbiome – the overall name for the trillions of micro-organisms that live within your intestinal tract. Your microbiome contains both harmful and friendly bacteria and it is the balance between the two that determines whether your gut composition contributes to – or diminishes – your health. Your diet strongly affects the composition of your microbiome – just as your microbiome also affects how well you absorb nutrients from food. Since probiotic good bacteria directly affect your immune function, and since rheumatoid arthritis is an auto-immune condition, it’s possible that changes in the microbiome may well affect the status of rheumatoid arthritis. There are several ongoing studies on this subject. Meanwhile there have been reports from rheumatoid arthritis patients that a multi-strain probiotic can provide a measurable level of relief. Pro-inflammatory foods like sugary drinks, pastries and high temperature cooked red meats may aggravate osteoarthritis if eaten too often. And some people may experience more pain if they eat substantial amounts of foods from the nightshade family, including aubergine (egg-plant), tomatoes, red peppers and potatoes. 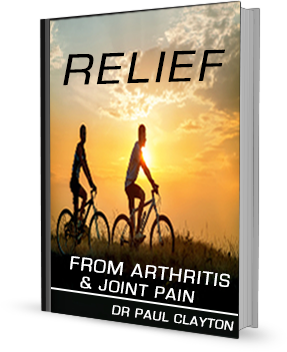 So far we have been discussing how the pain and discomfort of arthritis can be alleviated in a natural way by reducing inflammation. But pain is just the symptom – you will also want to help rebuild cartilage and joints to the extent that is possible. We have seen that cartilage is composed of the protein collagen. The most abundant amino acids in collagen fibre are glycine and proline. Glycine and proline are plentiful in animal-derived gelatin, which in turn is found abundantly in bone broth. You can make your own cartilage and collagen-building stock by simmering the bones of your choice with water, vegetables and herbs. Glucosamine is made in your body from sugars and proteins bound together. Glucosamine is a naturally occurring compound in joint cartilage, ligaments, tendons and synovial fluids (the lubricating fluids surrounding joints). So the premise for supplementing with glucosamine is that it should boost your levels and help alleviate arthritis symptoms. But does it actually work? Most original studies were done on animals, but human studies using single-nutrient glucosamine supplements show only a modest to nil improvement over a placebo in either pain relief or joint mobility. That is hardly surprising because in your body, glucosamine needs the presence of both vitamin K and vitamin D to build cartilage. So glucosamine on its own is unlikely to have a big effect. Your joint supplement also needs to contain vitamins D and K.
Several joint supplements combine chondroitin with glucosamine, but these two compounds have essentially the same function and glucosamine – providing it is accompanied by vitamins D and K – is sufficient. That’s exactly the concept behind JointShield, which was originally formulated by Dr Paul Clayton, the former Chair of the Forum on Health at the Royal Society of Medicine. It includes glucosamine, vitamin D, vitamin K, curcumin, pomegranate extract and beta sitosterol – a plant compound that also reduces inflammation – indeed it is a popular supplement for marathon runners to reduce the pain and swelling after a run. Schumacher HR, Pullman-Mooar S, Gupta SR, Dinnella JE, Kim R, McHugh MP. Randomized double-blind crossover study of the efficacy of a tart cherry juice blend in treatment of osteoarthritis (OA) of the knee. Osteoarthritis Cartilage. 2013 Aug;21(8):1035-41. doi: 10.1016/j.joca.2013.05.009. Epub 2013 May 31. Peregoy J, Wilder FV.The effects of vitamin C supplementation on incident and progressive knee osteoarthritis: a longitudinal study. Public Health Nutr. 2011 Apr;14(4):709-15. doi: 10.1017/S1368980010001783. Epub 2010 Aug 16. Haqqi, Tariq M (PI). Chondroprotective activity of pomegranate extract. Medicine 2012. C Black, C Clar, R Henderson, C MacEachern, P McNamee, Z Quayyum, P Royle, and S Thomas. The clinical effectiveness of glucosamine and chondroitin supplements in slowing or arresting progression of osteoarthritis of the knee: a systematic review and economic evaluation. Published: 2009.